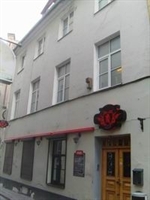 The three-storyed building may be used as a hotel, it is in the center of Riga, in the Old City. Thanks to the successful location it is very favorable object for investments. Today on the ground floor – working cafe. On the second and third floor working hotel on 12 numbers. The land – 127 sq.m. The building – 350 sq.m. 2 000 euros for sq. m.